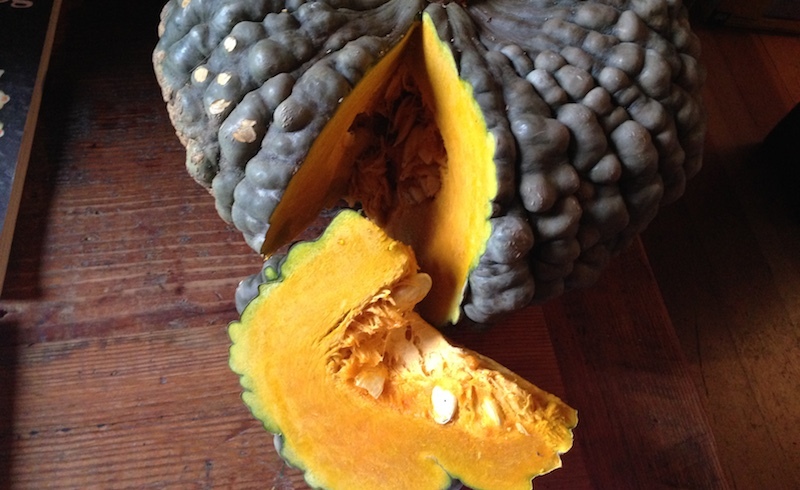 When was the last time you ate squash? How was it prepared? When was the last time you bought a whole squash? How many varieties can you name (besides acorn and butternut)? 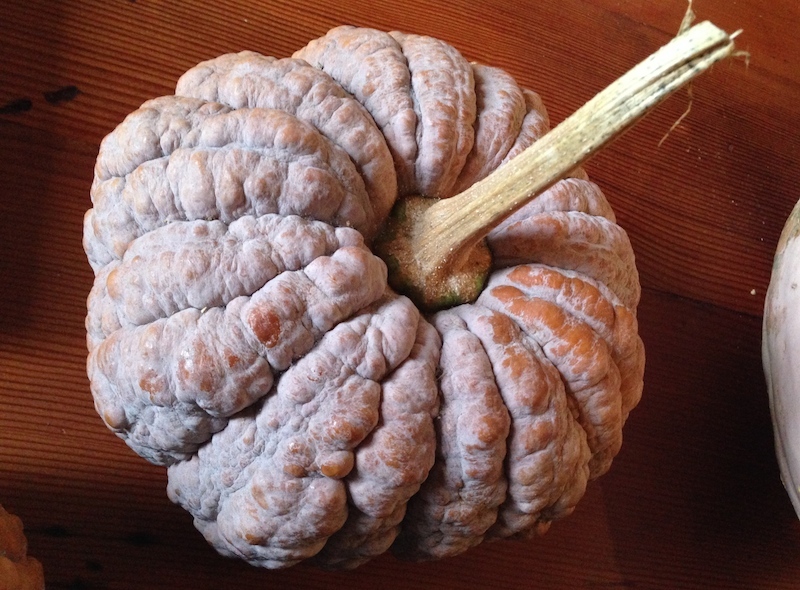 For answers to these and other squash-related questions, you should plan to attend the Squash Sagra, a festival devoted to all things squash this Sunday, December 3, from 11 am to 3 pm at The Redd on Southeast 9th and Salmon St. The Sagra—local festival in Italian—is free and open to the public in conjunction with the annual Fill Your Pantry event hosted by Friends of Family Farmers. Local chefs will be handing out samples of squash dishes they've prepared, sharing recipes and discussing flavors and culinary uses of the diverse varieties of squash grown locally. Farmers will be offering a wide array of vegetables, beans and grains for purchase on-site, so there'll be something for everyone. There'll be a squash butchery booth where chef Tim Wastell will share pro tips and techniques for cutting up and storing the larger squash varieties. Uprising Seeds, Washington state's first 100% organic seed company, will be demonstrating a European seed oil press to make your own seed oils. There'll be a kids' play area for younger folk to taste samples of these delectable cucurbits and learn about how squash grow. And of course there's the ubiquitous Photo Booth where you can cuddle up to the cucurbit of your choice and take home a photo that'll prove your love. "I've been wanting to do a sagra like this for a long time," said Lane Selman of the Culinary Breeding Network, one of the sponsors of the sagra. "Hopefully people will get really inspired and learn a lot about the different categories of squash that are grown in our area." 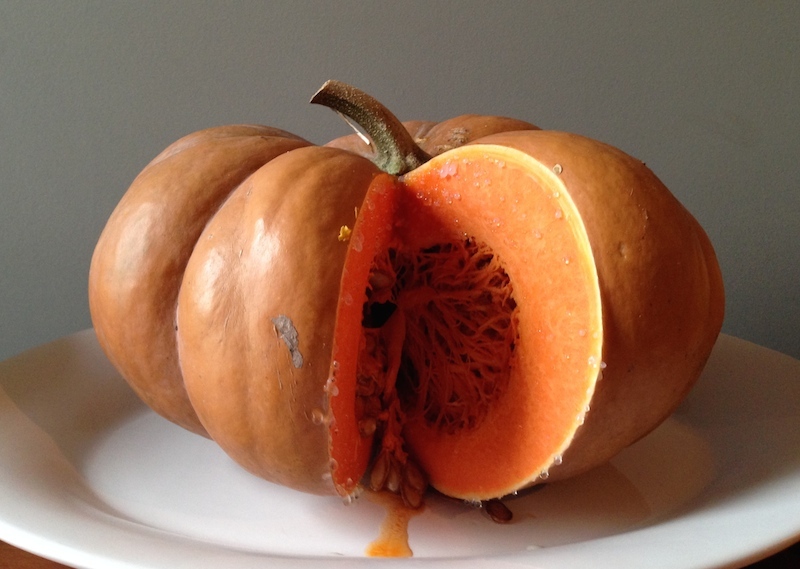 Get my recipes for squash soup, squash pie and squash risotto. Even squash sorbet (it's delicious, I promise)! 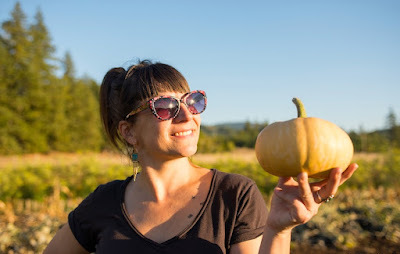 Top photo by Shawn Linehan featuring Lane Selman of the Culinary Breeding Network admiring a Doran Round Butternut squash from Adaptive Seeds Farm. You might ask why a farmer would devote nearly half his acreage to support a wetland rather than filling it and growing more crops. 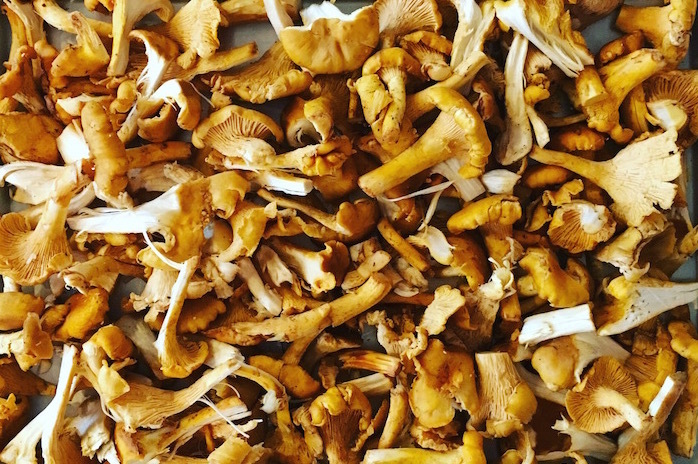 Contributor Anthony Boutard of Ayers Creek Farm has his reasons. It is hard to muster much sympathy for nutria, with their beady little eyes and humorless demeanor. Then again, the poor dears spend the summer quietly feeding and building among the tule and cattails—unobserved bliss in nutria terms. 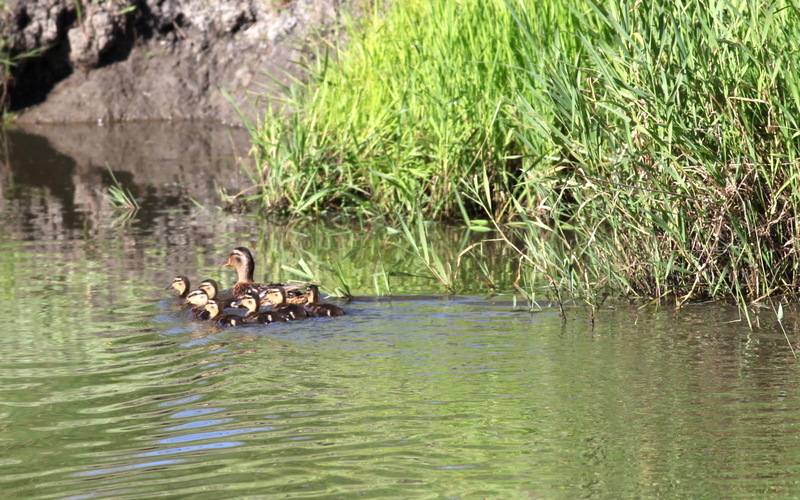 Then the water level rises and migratory water fowl descend. The geese and cormorants haze them mercilessly and defecate all over their tussocks, and the eagles eye them hungrily. They cluster together, four or five, to avoid being picked off as prey. This morning the water is very high and a shard of sympathy is felt. Patches of tule at the south end of the wetland. 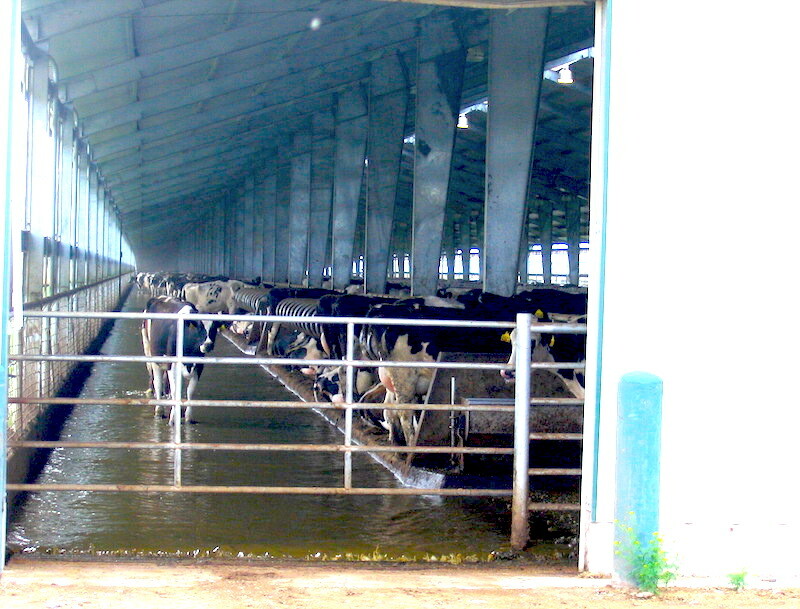 Ayers Creek Farm has nearly 80 acres of ground suited to the production of crops. The remaining 64 acres include a 40-acre open wetland, 20 acres of oak savannah and some swales of green ash and hawthorn. A little over half the farm is a managed landscape, a little under is largely unmanaged. It is hard to imagine the farm without its two hemispheres. For us, a highly productive square of farmland would be a dull place indeed without the messy exuberance of the wild areas bleeding into our efforts at an organized ecology. This spring we were approached by a botanist volunteering for the UFWS [U.S. Fish and Wildlife Service]. Ginny Maffit was curious about our bottomland which, she had heard through the grapevine, was a fine example of an undisturbed wetland community. In response, we explained the process whereupon it became “undisturbed,” a term the nutria would dispute. Several notes, edited and merged, describe how the wetland developed and matured. 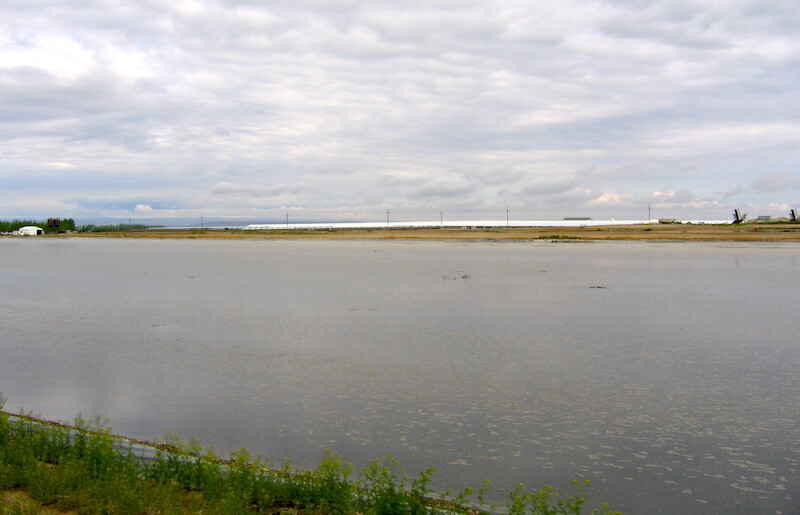 Our wetland, about 40 acres in extent, was cultivated until 2002. It is mostly Labish muck*. Because it is outside of the local dike system, it tended to flood early, making harvest difficult. For many years, the "Wapato Improvement District" managed water level in the valley bottom for onion growing. Over time, onion growers died off and their families eventually sold the various holdings to the U.S. Fish and Wildlife Service for a Wapato Lake refuge. As onion-growing petered out, pumping patterns within the dike changed, increasing the challenges. 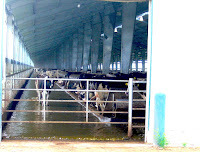 We asked TVID [Tualatin Valley Irrigation District] to let the water rise as security measure for the other irrigated fields on our property, providing a buffer capacity. We fretted initially because many people told us we would end up with a thicket of reed canary grass. Several people identified a certain piece of property within the lake, owned by a federal agency, that turned into a canary grass wasteland. We had never seen it, but heard about it a lot. On the other hand, along highway 47, south of milepost 22, there is a small patch of wetland that we had always envied because of its vegetative structure. We poked about the government websites researching wetland restoration, but the approach always seemed to be heavy-handed and inconsistent with our appreciation of natural succession. We are organic farmers by disposition. In addition, we have confidence in the way natural systems can repair a site. The first few years a low, rhizomatous grass took over the low areas on the site, dominated by Labish muck. And, as predicted by Gaston's Greek chorus anticipating another tragedy, reed canary grass quickly occupied the Wapato silty clay soils, a foot or two higher in elevation but still flooded from October through March. Another year or two passed, and we noticed the vegetation was starting to shift. Through the thick thatch of the "witch" grasses, we saw new plants emerging. In the reed canary grass, several different woody plants established themselves, including roses, ashes, hawthorns and spirea. By 2007, the bottom had developed a remarkable mosaic of vegetation types. Tule, bulrushes, cattails, wapato, sedges, rushes and various grasses were all represented in bands and islands. The hardwood shrubs and trees are now establishing themselves along the fringes. It is a beautiful example of a natural wetland succession, predominantly native in composition. 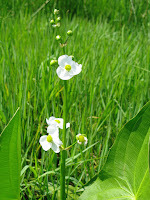 Now the Chorus’ chant can praise the natural qualities of the wetland. Yes, there are some non-native species, especially along the eastern fringe. However, the bulk of the wetland represents as fine a native wetland as you can find, resulting from a simple, just-add-water approach. Cost us next to nothing in treasure or effort, and has provided endless pleasure. 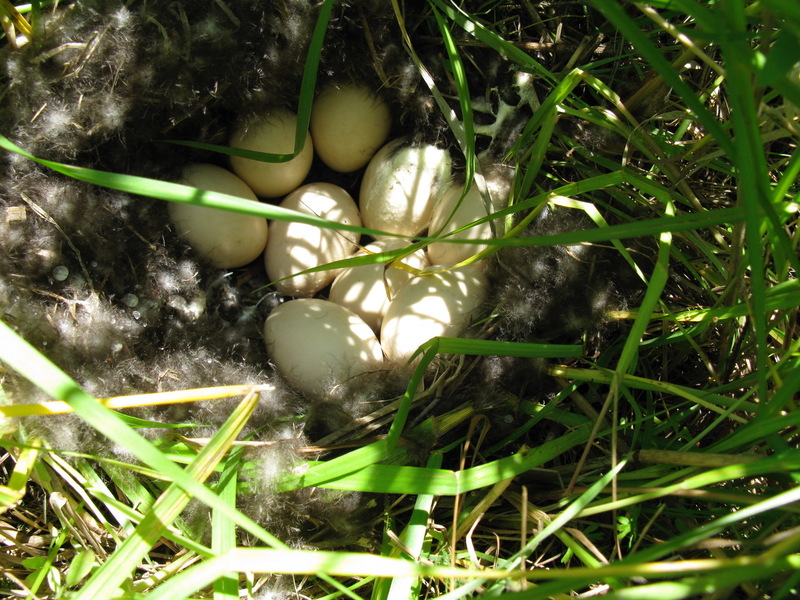 There is a rich assemblage of nesting birds. 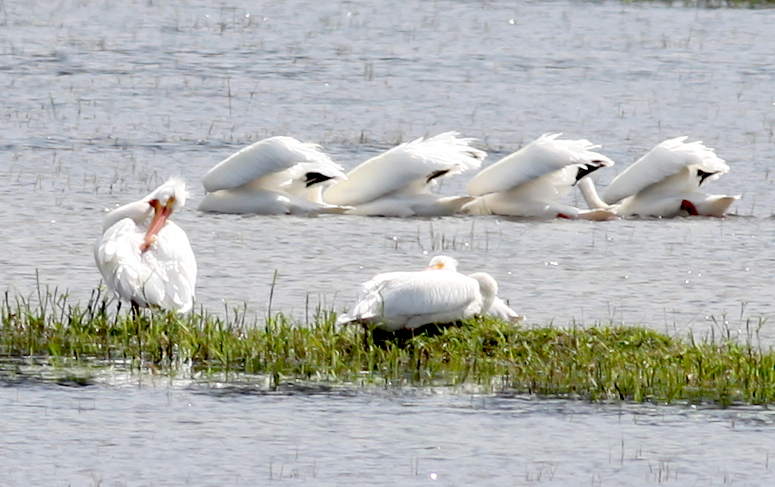 The last two years, we have had between 20 and 65 white pelicans foraging in the shallows during the spring. One sultry evening this summer, we spent an hour watching a yellow breasted chat as it bounced from one perch to another. 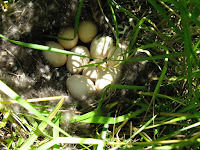 At the south end, there is a big patch of tule where the marsh wrens build their softball-sized and shaped nests. Another reason to tarry on the way to nowhere in particular. Drained wetland systems that have been cultivated for decades do not have much to contribute vis-a-vis their seed bank. So how did all these plants find their way to our swampy hole? 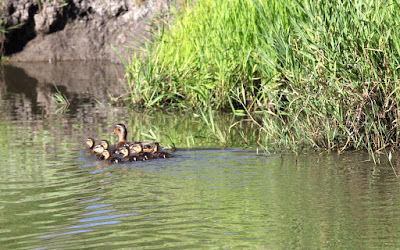 Wetlands are generally connected via water courses and/or fauna (birds and mammals), and these provided the seed source. Growing up in New England, we are familiar with shifting wetlands following a move-in by beavers damming a stream, necessitating a portage. Within about the same space of time as our wetland development, these ponds would fill in with the species typical of wetlands along the water course. 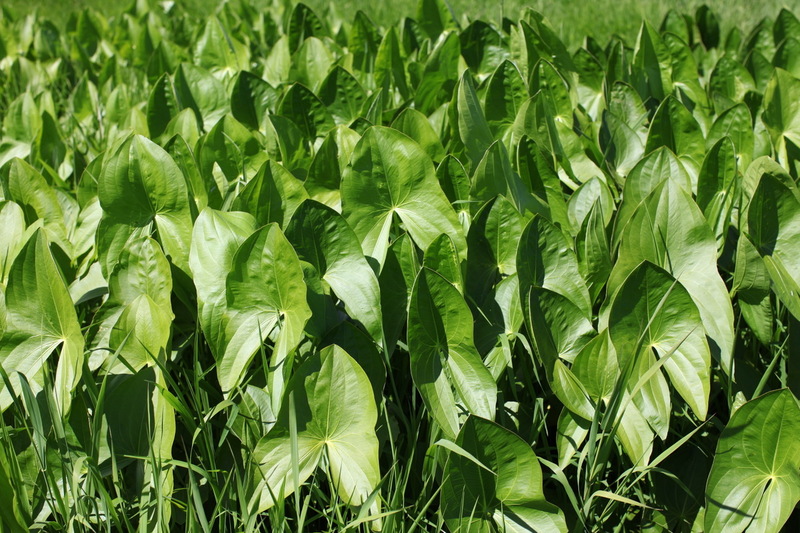 Wapato or Arrowhead growing in clumps. Our wetland is illustrative of this mechanism. 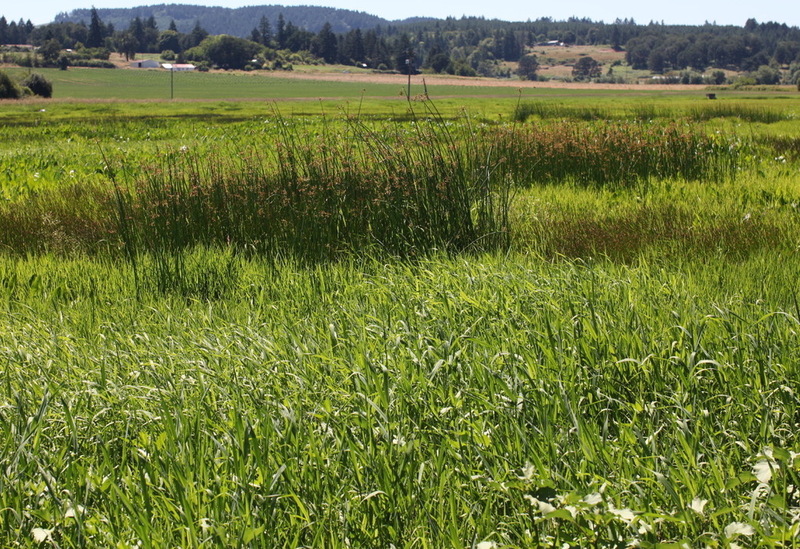 As we are outside the dike, we received seeds and other propagules from the diverse, vestigial patches of the original Wapato Lake that fringe the outer wetland fragments that have never been cropped. Not of great extent or particularly interesting to most, but of immense importance to holes. As the system drains in late winter, the water flows upstream from these patches, as well as downstream, so we get a nice dose of propagules from these areas. Because it is a case of mass selection rather than a managed planting, the various species and assemblages find their appropriate place in the mosaic of soil types and water depths. Planted “restorations” in our estimation always look planted, a forced pattern discordant to the eye. We see our patch of wetland as a grow-out of the Wapato Lake's historic flora, maybe not complete in terms of species but functionally whole. It provides a summer home for the bitterns, grebes, rails, marsh wrens and cinnamon teal and other ducks. We have a large and diverse population of dragonflies as well, and they spend the summer hawking among our crops. All-pelican production of Swan Lake. Among the birds is a tundra swan that has been there since January or so. It was probably injured rather than uninspired to take flight, however it an observation based on sedentary behavior rather than seeing an injury. Otherwise very healthy, no signs of distress. It continues to stretch its wings, moves well on land and water, a nice natural water feature. This autumn it has been joined by 16 other swans, including two grey cygnets. This is the second year we have hosted white pelicans, one evening we counted 65, though typically they numbered around 24. These huge, ungainly birds are spectacular when they come in to land. The swan, unimpressed by their magnificence, stayed apart, and engaged in some agitated head bobbing when they came close. Over that last four years the wetland, formerly leveled for agricultural use, has developed a distinctly hummocky aspect. The architects are the nutria, regarded as vermin by most farmers and used as target practice by local kids. These hirsute engineers create channels and pools so they can move about the wet areas safely and efficiently, their own variation of Venice's canals. There may be muskrats as well, but the nutria are the dominant rodents. Walking the wetland's fringe, it is apparent that the channels of the rodents are extending the wetland vegetation in the areas dominated by the reed canary grass. Wetland plants are well adapted to herbivory. In fact their growth is generally stimulated by the activity, as is evident by the work of the nutria. Native Americans observed and understood the stimulatory effect of their harvest, and maintained vigorous beds of wapato. That is why we are sanguine about harvesting some of the corms for our restaurant accounts. 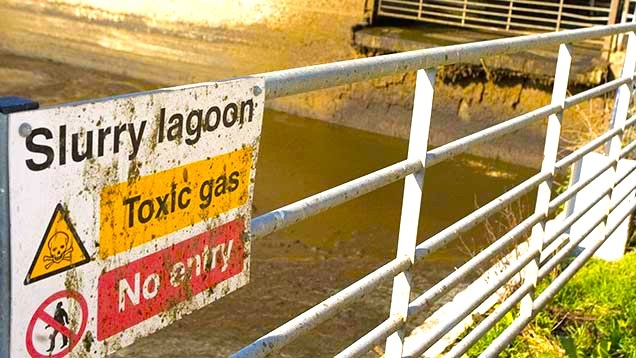 * Muck is a high organic content soil type formed from former lake bottom deposits. “Labish muck” is a series found in the Willamette Valley. The type was first described from the remains of Lake Labish in the Salem area. 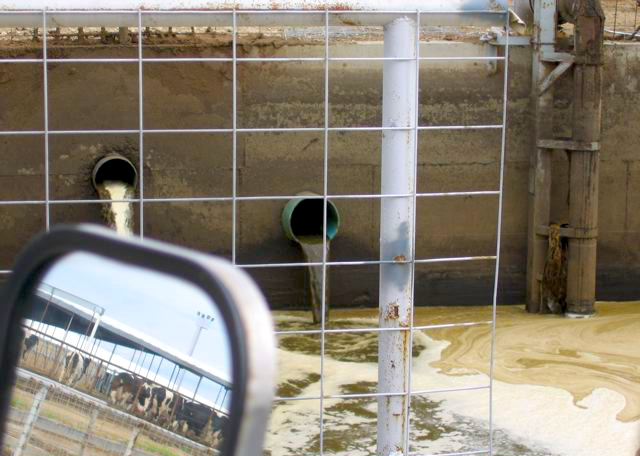 The muck of Lake Wapato shares its characteristics, so it falls into that soil type. All photos by Anthony Boutard. 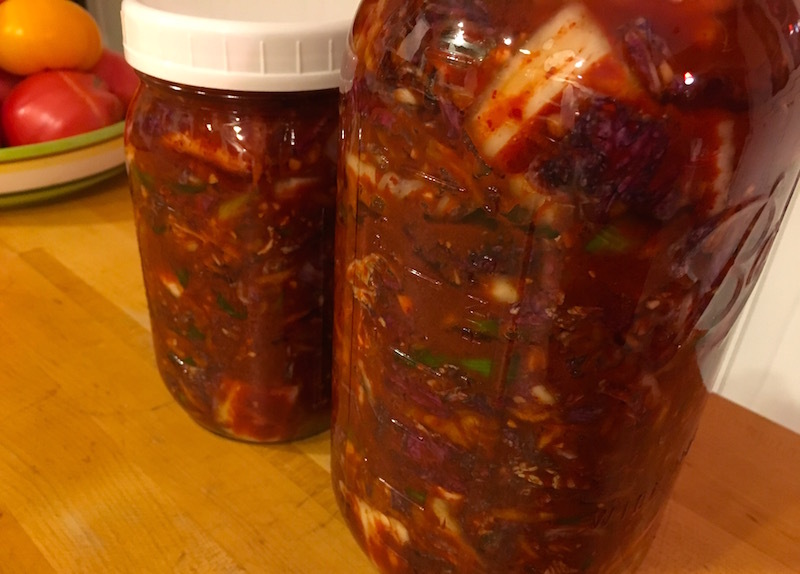 But with assurances from experienced friends that neither of those outcomes was likely, and with one quick experiment under my belt—a shrub, or drinking vinegar that my neighbor Bill shared with me—I've decided to tackle kimchi, the ubiquitous pickled and red-peppered cabbage dish found at every meal in Korea. My goal is to make a kimchi similar to the one I had as a foreign exchange student in that country, made by my host mother and stored in earthen crocks on the flat roof of her home. I've found a commercial one that's very reminscent of hers, the Napa Kimchi made by Choi's Kimchi, a local company that began when founder Chong Choi took his kimchi, which he'd been making for his family and sharing with his neighbors, to sell at the farmers' market. Starting with that profile, for my recipe search I decided to start slow, with a super simple recipe by Julia Moskin of the New York Times that she adapted from Tart and Sweet by Kelly Geary and Jessie Knadler. While it worked like a charm—No death! 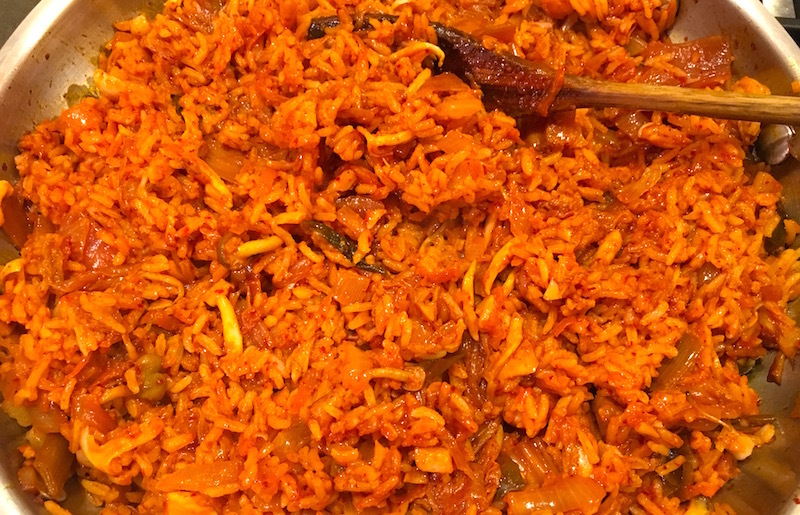 No explosions!—and was quite delicious, it's not as spicy or quite as vinegary as my Korean mother's (or Choi's). So I'll keep looking for recipes that will measure up to those fond and drool-inducing memories. Kimchi, and lots of it! In the meantime, these experiments mean that I've got jars of the pickled, cabbagey Korean condiment resting comfortably in my fridge. Julia's recipe produced about three quarts or so of the stuff, and since my family isn't in the "let's have kimchi for every meal" groove, in order to clear space for the next batch I've had to come up with some creative uses for it. This kimchi fried rice recipe is cobbled together from several online sources and is terrific all on its own or when combined with various proteins—think tofu, leftover chicken, even seared slices of beef. 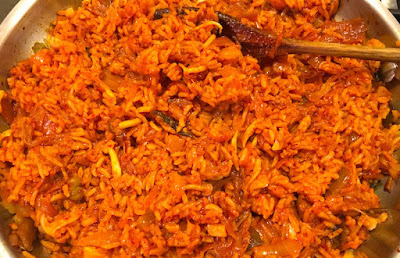 You can cook up the rice just for the recipe, but if you have leftover rice sitting in the fridge, I think it actually works better. And I'll keep you updated on my quest for that kimchi of my dreams! In large skillet or wok, heat vegetable oil over medium-high heat until it shimmers. Add bacon and sauté until it starts to render its fat. Add onions and sauté till tender. Add garlic and stir to warm it, then add kimchi and mushrooms. Sauté until tender. 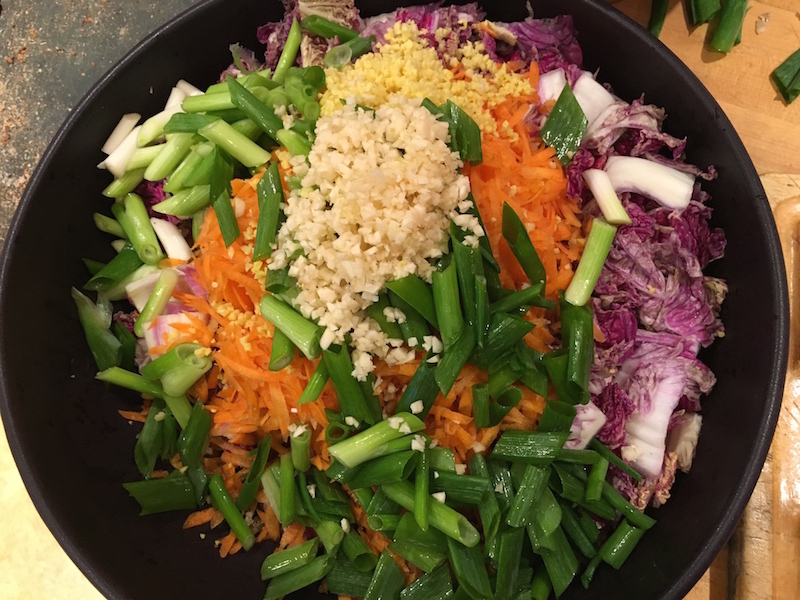 Add rice and sesame oil and combine well. When it’s warm and starting to stick to the bottom of the pan, taste it for seasoning and add fish sauce and gochujang, as well as salt, if desired. When ready to serve, fry eggs separately in a bit more vegetable oil, keeping yolks soft and runny. Put the fried rice in a bowl and top each serving with a fried egg (or two). 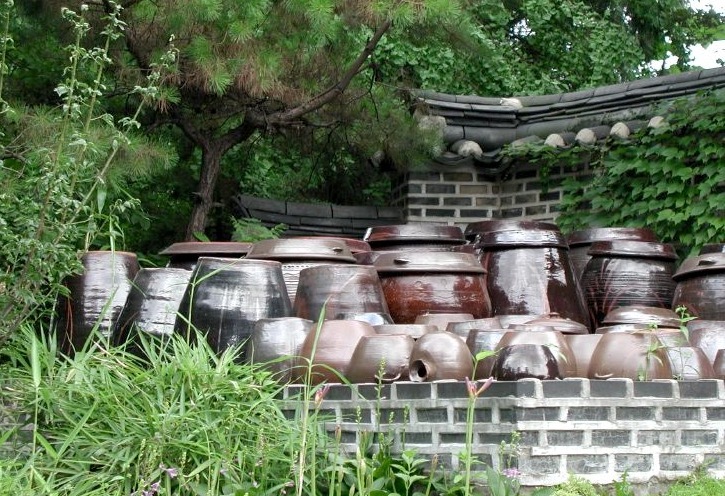 Photo of kimchi crocks (onggi) from Wikimedia. 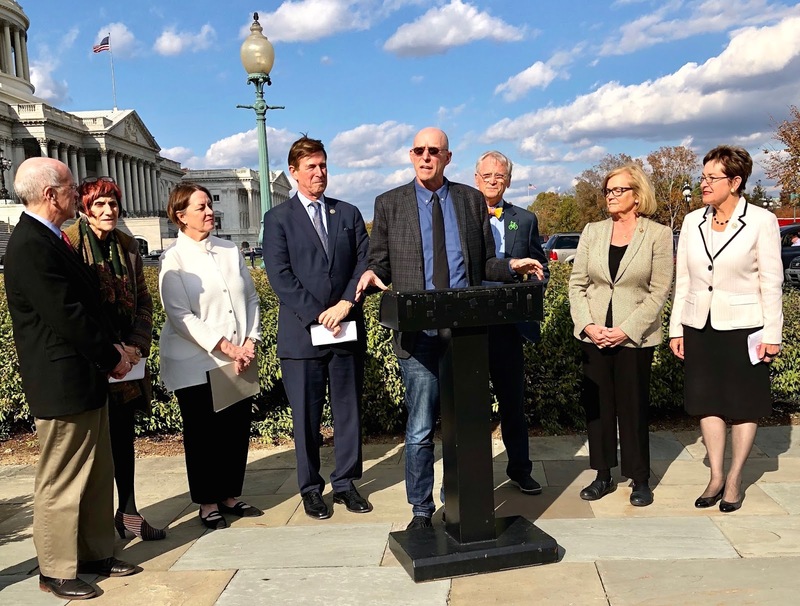 Today Oregon Congressman Earl Blumenauer is hosting a broad range of experts and stakeholders for a forum titled “A Call for Reform: Fix the Farm Bill,” that focuses on the need to create a more visionary, equitable and cost-effective farm bill. The forum features Michael Pollan (top photo, center), author of The Omnivore’s Dilemma, who is delivering the keynote, followed by a panel discussion with a group of policy experts to discuss their ideas for the reform that he's calling The Food and Farm Act. In an interview about his re-envisioned farm bill on the website Civil Eats, the congressman said that "we continue to pay too much to the wrong people to grow the wrong food in the wrong places" and that he's working to reform subsidies to support innovation and small-to-midsize farmers rather than large corporate agribusinesses. As he told Good Stuff NW in an interview earlier this year, he's building a coalition of consumers, farmers and non-profits to provide "support for protecting the environment, water quality, habitat [and] things that help the farmer and have broader social and economic benefit. The big issue is that all the attention and subsidy is skewed toward things that don’t need it, and shortchanges things that do, upon which we’re heavily reliant." One unique element of his efforts is a comic book, "The Fight for Food: Why You Deserve a Better Farm Bill," that explains why the Farm Bill matters to people who care about their food and talks about how they can get involved. Read my interview with Rep. Blumenauer, part of "The Future of Our Food" series. Photo courtesy Rep. Earl Blumenauer's office. Sad news came today that Alex Corcoran, owner and publisher of Edible Portland magazine, has announced that the magazine will cease publication after the current November/December issue. Corcoran bought the magazine last year after Ecotrust, which had owned the publication since its inception in 2006, decided to cease publication after the Spring 2015 issue and put it up for sale. At the time that Corcoran bought it, Eric Thorkilsen, then-CEO of Edible Media, said, "Alex has a great track record of success managing Edible publications, starting with Edible Rhody [Edible Rhode Island] and continuing with Edible Seattle. His capacity to immerse himself in the local food community—forming solid relationships with small businesses and attracting a devoted readership—suggests a great future for Edible Portland." The first edition under Corcoran's leadership was the September, 2016, issue. Corcoran initially posted an ad for the sale of the magazine, but because of contractual disagreements with Ecotrust, he has pulled the ad. In an e-mail to Good Stuff NW, Carolyn Holland, VP of Engagement at Ecotrust, said that Corcoran "does not have the rights to sell the magazine. He has been in breach of his contract with Ecotrust since 2015 when he signed on to assume the license. While we were working with him to give him time to get it on track, now that he has decided to fold, the rights to magazine will revert to [Ecotrust]." Mr. Corcoran declined a request to comment for this post. "Free Range Media, publisher of Edible Portland, is ceasing publication of the award-winning magazine at the end of 2017. According to a previous agreement, Edible Portland will return to its original owner and publisher, Ecotrust, which originally launched the magazine in 2006 as one of the first Edibles in the nation. Ecotrust will work with the national media organization Edible Communities, licensor of more than 90 Edible magazines across the United States and Canada, to find a new home for the magazine. 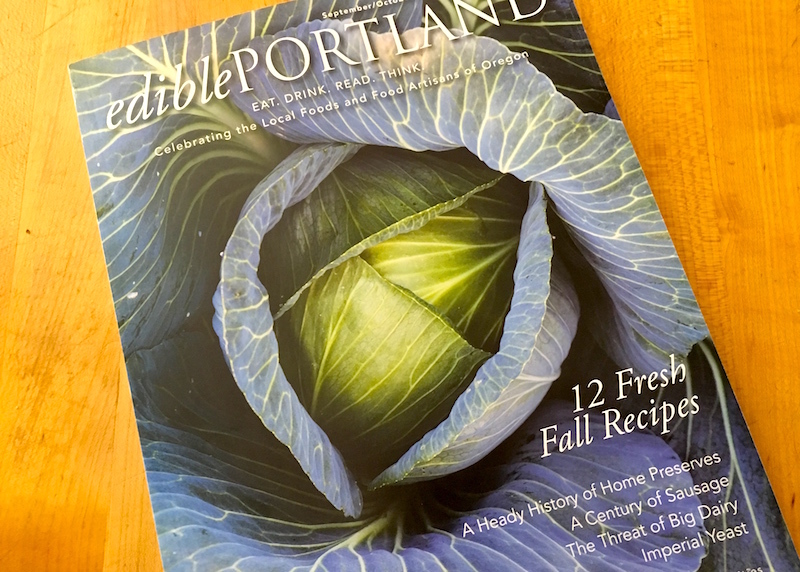 Edible Portland boasts a devoted readership of more than 75,000 and has a solid base of both advertisers and contributors. Ecotrust is committed to supporting a smooth transition in ownership. If you are interested in becoming the publisher of Edible Portland, please contact Carolyn Holland, Ecotrust’s VP of Engagement, at 503.467.0754." Read my recent article for Edible Portland, "Big Milk: Big Issues for Local Communities." Correction: An earlier version of this post mistakenly stated that Edible Seattle was for sale. It is not. Corcoran is inviting a new publisher to start an Edible magazine in the South Sound area. The following post was written by contributor Anthony Boutard of Ayers Creek Farm for Big Picture Agriculture, an excellent blog about trends and developments in agriculture, food and farming. "Anthony Boutard, born in Massachusetts, grew an early appreciation for plants from his father who was a renowned botanist. Educated as a biologist with a graduate degree in Forestry, Anthony and his wife Carol moved out to Oregon in the early 1990s for Anthony to work with a company called 1000 Friends of Oregon, which focuses on land use and landscape preservation. 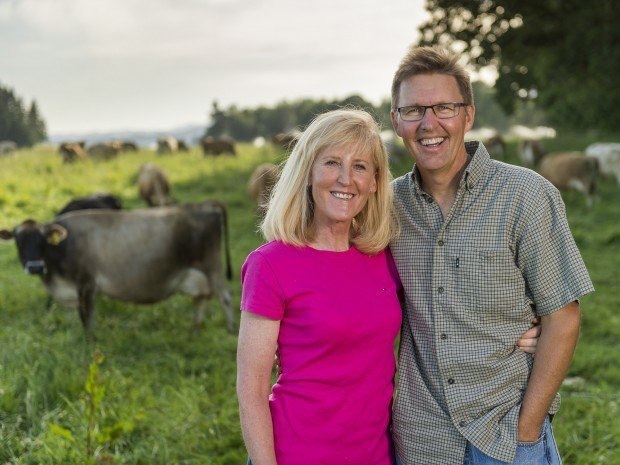 After a few years in Portland, Anthony and Carol decided to take up farming and purchased a 144-acre working farm out in Gaston, about 30 miles from the city. Their philosophy is simple: to grow what tastes good and does well on their land." 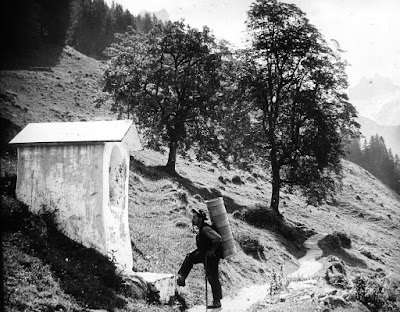 The photos below are "lantern slides" taken c.1900 in a beautifully rugged region of Switzerland. 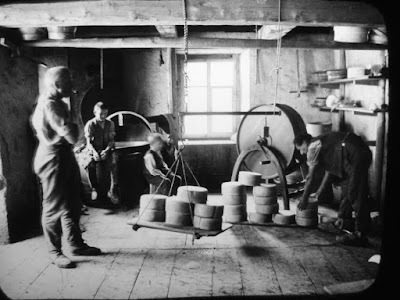 Anthony assumes that the photos were taken by his Danish great-grandfather, Ernest Boutard, an engineer who had a patent partnership in Copenhagen, but whose heart was at home in the mountains. He studied at the Polytechnic in Zürich. His grandmother's family was from Graubünden, Switzerland. 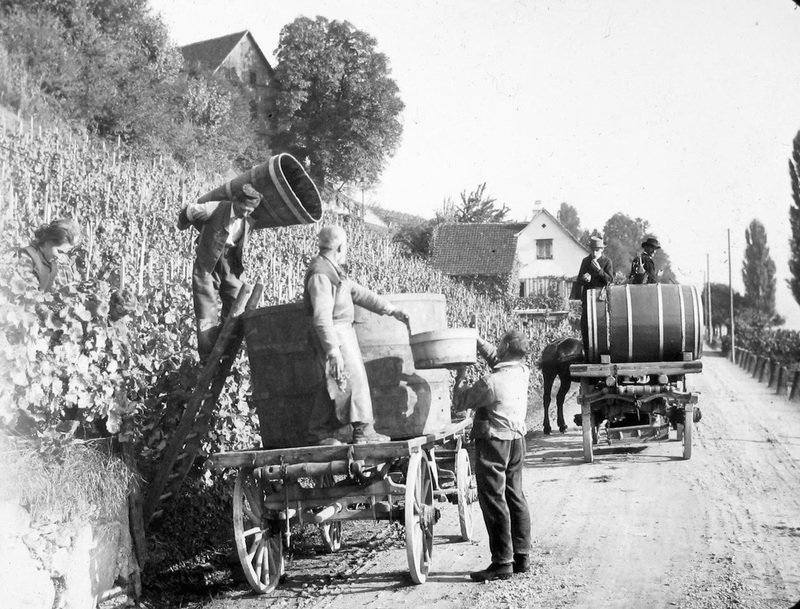 Harvesting wine grapes, most likely in the canton Ticino. Note the tile roof on the buildings. Ticino, bordering Italy, is the mildest region of Switzerland. A building for storing grains. 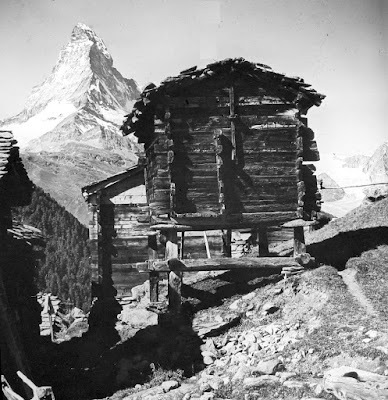 The flat rocks between the granary and its supports keep rodents from entering the stores. Yes, that is the Matterhorn in the background. Flowering chestnuts growing in the canton Valais. The chestnuts were called the "bread of the poor," providing sustenance in challenging times and circumstances. Roasted or boiled when fresh, they were also dried and ground to make a flour for polenta and baking. Milking goats in a high summer pasture, as well as goats being goats as is their wont. 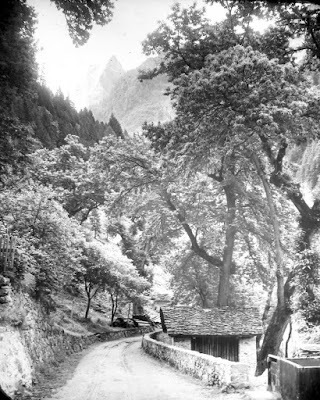 This was taken either in the canton Appenzell or Graubünden (Grisons). These are the progenitors of what is known today as the Grisons Striped goat, a tough mountain breed at home in sparse rocky pastures. 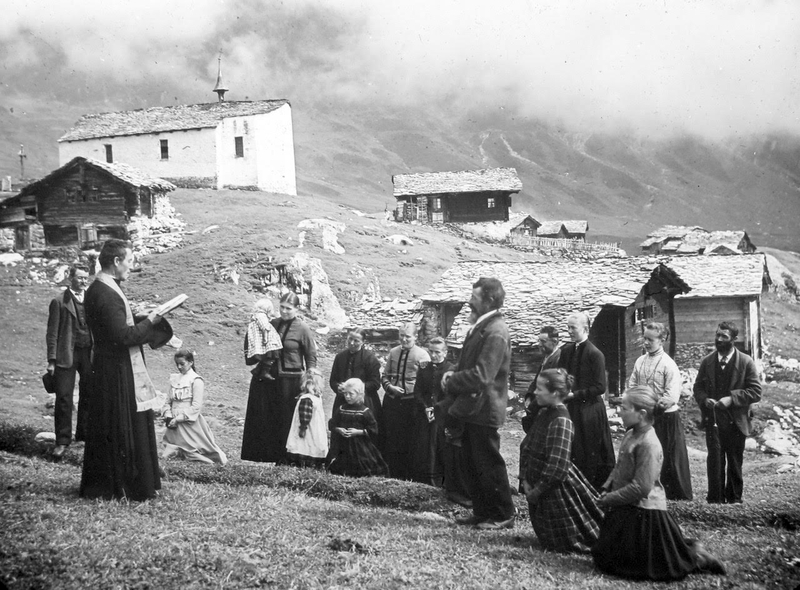 Service in a mountain community, probably in the Appenzell. The 19th century saw the depopulation of rural Swiss communities. 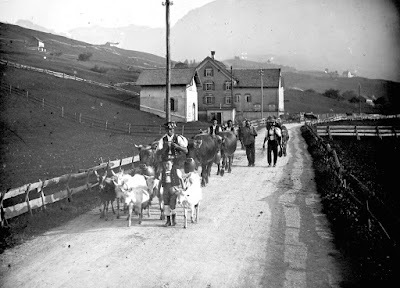 Some to other European cities, like my great great-grandfather who left his small village in Graubünden and learned to make pianos in Cologne, Germany, ultimately settling in Zürich. Others immigrated to the Americas. There are people of Swiss descent from Argentina to Canada. 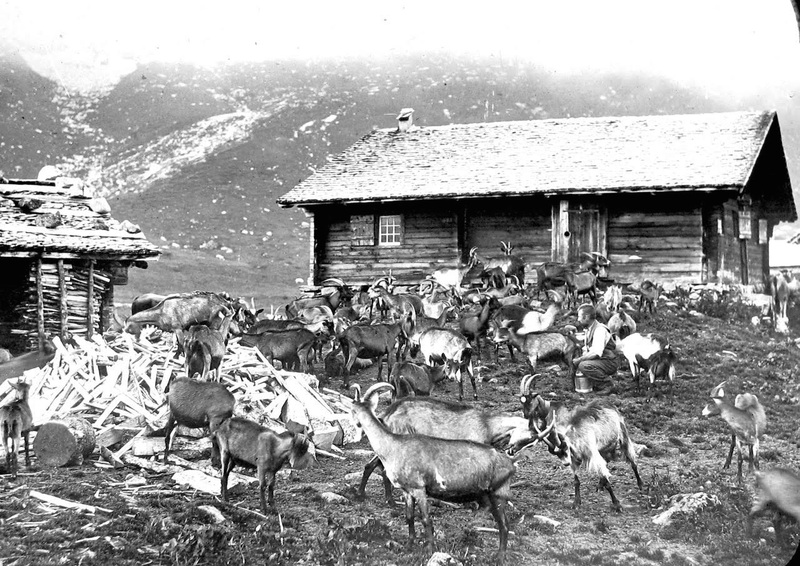 At the height of the exodus, during the 1880s some 82,000 migrated to the U.S. Towns named Bern, Helvetia, and Glarus, names which betray their Swiss roots. 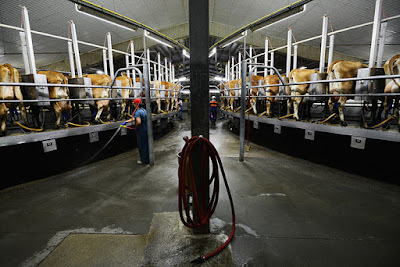 Thanks to Big Picture Agriculture and Anthony Boutard for allowing me to share this essay.